Meet me -- SHREYA: Keep Texting !!! When Niru went to shopping late with her friends , she received her mom's text saying "WRU?? ?....LOL " she imidiately knew her mom wanted to know "Where Are You....Laughing out loud" she thought her mom is so cool she smiles even when she doesnt know where I'm. After a few days and on constantly receiving LOL at the end of every message niru got curious to know why her mom was acting so funny all the time, it was on her asking that she knew that LOL was not Laughing Out Loud but instead it was " Lots Of Love " from a mother to her daughter. How many times has it happned that we have misinterpreted an SMS for being unaware of its abbreviations, several times right? SMS an abbreviation in itself " Short Messaging Service " has been on toe ever since the mobile/pager communication came into being then rates of a single sms were 2- 3 Rs to now even when rates of per sms have slashed to 1 paisa. If you are between 18 and 30 and you own a mobile with SMS. And you love sending messages that match your mobile size.You are sure to know and enjoy the spree of sms codes. Communication now no longer needs long words and fully formed grammatically correct english. It is just meant to be understood by the receiver and has to be space and time efficient. The coolest trend inhibited by the youngsters says "Write less and saying more". "I use short forms alot cuz i dont feel lk writg out a word so i wud just use da short 4m.I feel it is smrt and creative 2 use such shrt-4ms!." my friend smsed and opinionated herself on this issue. Social Networking sites communities and other forums have thrown out grammar and seem no longer interested in it. SMS's cropped words and grammar-less sentences have helped communication take a big leap.What sms brings to you is a smarter and easier form of english that gives a boost to the confidence of people who arent very thorough in english, they gain the similar kind of respect as an english literate (even though their english is concealed in sms). Talking via chatting has to get less tedious and more enjoyable so when you can sms someone "BBS" ,"GMTA " "GAL" , "LTNS" and so on who will type and write "Be Back Soon"," Great Minds Think Alike ","Get A Life", "Long Time No See". Not every youngster is to be blamed for writing short forms. "I'm 13, me and my friends (most of them) don't use shortforms. We actually type out the whole message. I find it hard to decipher the short forms, which are constantly changing" says Kiya on an internet forum. While Nitya replies "I only convert some of them to short forms when I have too many characters. Imagine if I am only allowed 160 characters for a message, it doesn't make sense for me to pay for 2 if I am just a few characters extra. " Nobody wants to pay extra for 2 sms's if you can fit in a message in one sms. But its eventually brought lot of people into concern over the original english. "There are SMS users who wouldn't dream of splintering the language," says Moushmi, M.Phil, who teaches English online. "A lot of people I talked to said they took pride in never condensing their sentences. Their punctuation and spelling - they claim - is intact." Language has grown into many forms ever since the evolution of mankind its a means to make comunication simpler and easier. What english was in the world of Shakespear and Milton would never exist again since its far more pain staking to understand what that meant, even though at one point of time it had been the most purest form of linguistically correct english. Old words have got dressed in completely new meanings and have been from then accepted as such. Do you know "awefull" once meant "awesome" ? The idea of dropping out a few vowels and shortening for convience makes no harm if there is any form of standardization. English is increasingly getting localised. There is British English, American English and Australian English to begin with. Millions of people are SMS-ing their thoughts across the globe. In fact we need to have a common code for SMS. If that comes through dropping vowels and going by the sound, why not? Without any standards marked, abbreviations will always be in confusion.
" 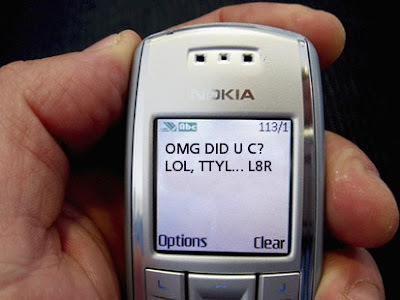 The short forms and language used in SMS typing has brought ruin to the English language itself. Frequent SMS users are not able to write correct English- neither the grammar nor the spellings are correct. Even in the English exams, the students use their ‘SMS language’, and are not able to correct themselves in the future, despite losing marks for the same. " remarks Ishita who teaches english in a school, who hates any change in her favourite language. There are some who have adapted to this change despite their unliking A.K Rao an elderly Bank personnel says " I am 48! I used to hate to see shortforms being used by yongsters in SMSs! Like U is used to indiacate You, 4 is used for 'for', 1 is used to say one, R is used for are etc. I used to get annoyed and angry thinking that these kids of today are spoiling the language of English. But now a days having got exposed to this type of language I think you really require imagination and skill, so that your message should be short, easily constructed and at the same time it should be easy for others to understand! I have developed interest in such messages and I try to construct my own messages with such shortcut languages and I feel that I am also travelling with time and not against it! " There's no doubt that English will always be an important way of communication all over the world, with India being the largest English speaking country the flavour and spirit of english would not be destroyed with a few people abbreviating their messages. The english lover troop in India is still alive and burdened to keep it going to savour the best of literatures in the world. So the next time anyone send you " I<3 U " , dont be a great mathematician solving how come I be less than 3 times of U but instead it could be the pictogram of a heart for "love", and the letter "u" replaces "you" "I Love You". sure pawan i just went to rajasthan hoping to write a new article on the same ...keep boosting my confidence..
and thank you for visiting ane appreciating my work..
Hope you keep checking in for future posts also..
no problem .. return when you have enough free time.. awaiting for your opinion. I've already owned an audio editing tool with no bookmark & region handlers. I discover it so inconvenient to find out the segment i want once more. I really require item to point my file of audio. Can you give a free of charge tool to do this? I wanted [url=http://www.topvideoconverter.com/audio-editing-software/]audio editing tool[/url], but it requires cost.